Chances are, if you’re a foodie, you’ll appreciate fine French food (I know that I do!). So what could be better than a foodie subscription box that’s showcases the very best of French cuisine? 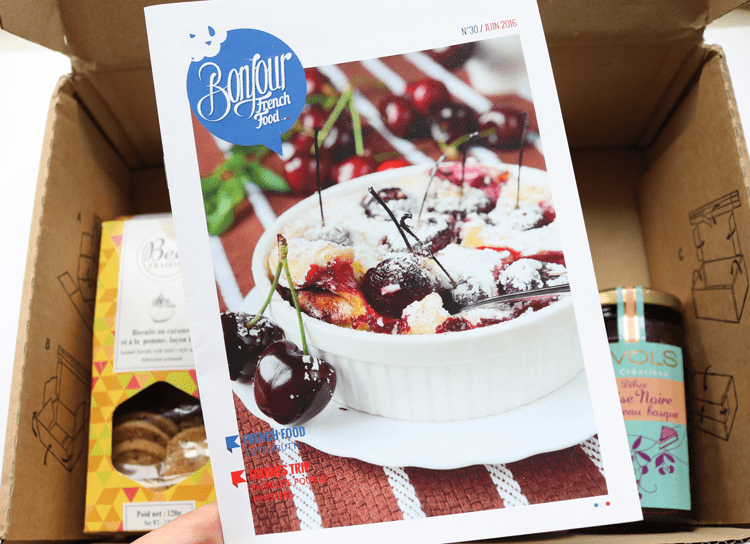 Each month, the team from Bonjour French Food, expertly choose 5-7 new and traditional French products from all over the country, package them up in a box and ship them straight to your door. Everything comes in a sturdy thick cardboard box with careful padding around glass items to ensure that they arrive in perfect condition. 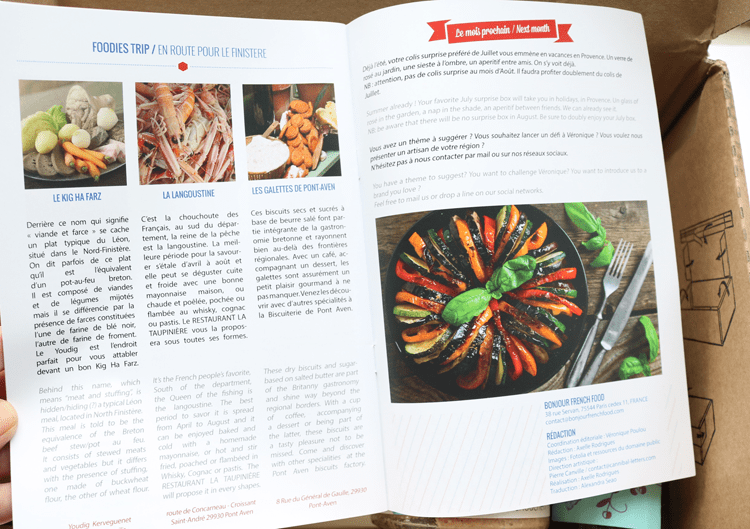 In addition to the food items, you also receive a magazine that’s written in both French and English. 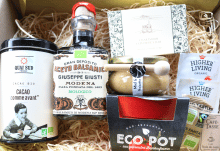 It provides further details of the products that you’ll find inside the box with handy serving suggestions, and also has recipe ideas, restaurant reviews and cultural French news to keep you up to date with the latest food and drink trends across the pond. 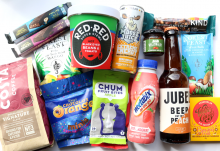 Below are the contents of June’s Bonjour French Food box which contains six delicious products. Let’s take a closer look shall we? 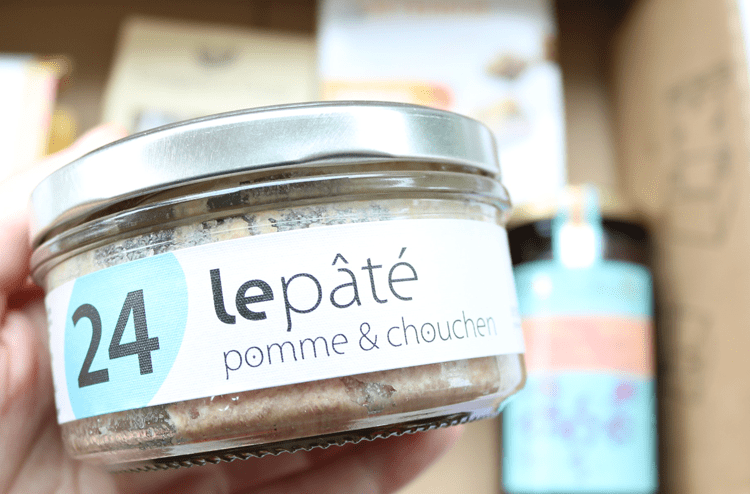 The first product that I unwrapped was a jar of La Conserverie Artisanale Pâté Pomme Chouchen (worth €4). Unfortunately as I’m a vegetarian I don’t eat pâté, however my sister is a fan and loved this one. It’s made from mainly ground pork, apples and chouchen which are all sourced from the Breton region. 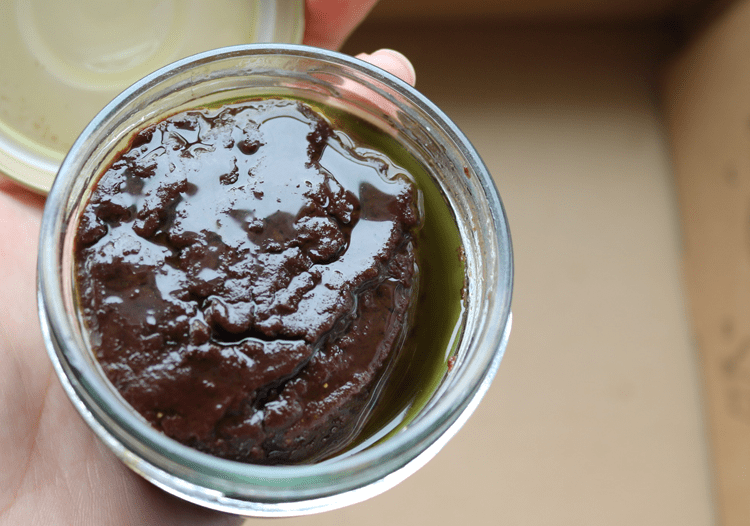 My sister said that “it had an unusual sweet and sour taste that was very different from other pâtés she had tried, but she really enjoyed it as an appetiser”. 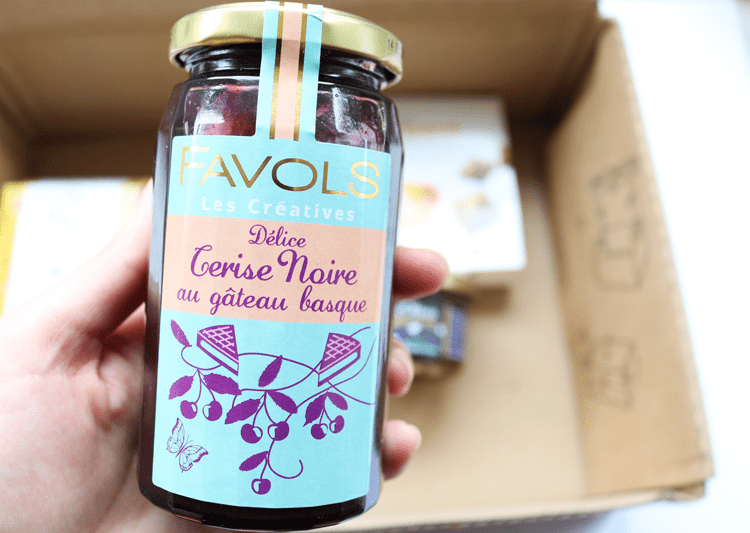 I love jam and this Favols Confiture De Cerise Noire (worth €4.60) is absolutely delicious. It’s a very rich, thick black cherry jam that’s perfect for adding to cakes, and this particular one comes from the French Basque Country. I think this would be ideal for a truly decadent Black Forrest Chocolate cake recipe, mmmmmmm. The third product that I pulled out was another jam item, however this is completely different to anything that I’ve ever tasted before. 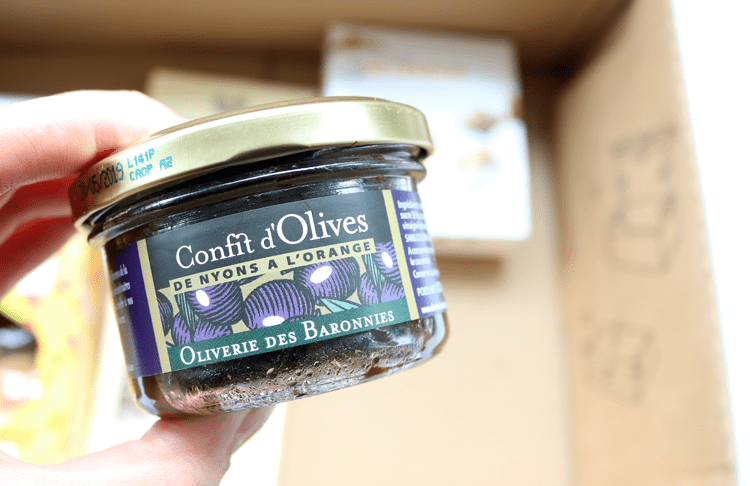 It’s a jar of Oliverie des Baronnies Confiture D’Olives Aux Oranges (worth €4.50), which is essentially a black olive jam that’s blended with oranges and candied orange peel. At first taste, you get a really strong hit of olives, then a lovely subtle sweet orangeness comes through. I followed one of the traditional French serving suggestions that was listed in the magazine and had this on some crackers with a little goat’s cheese – it was amazing! 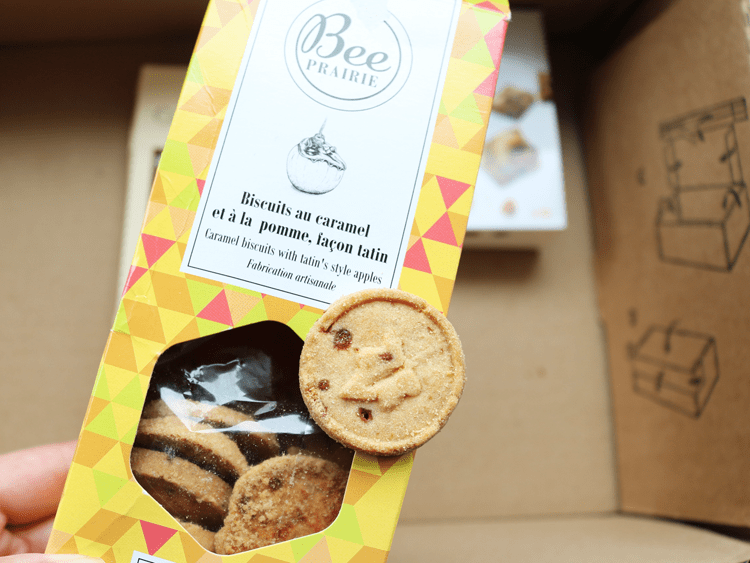 The French are well known for their biscuits and this packet of BEE Prairie Biscuits Caramel Et Pomme (worth €5) really hit the spot. They’re cute little round biscuits that have a buttery, melt in your mouth, crumbly texture, and are flavoured with caramel and pieces of tatin’s style apples. It was hard not to eat the whole packet in one sitting because they are so moreish! The next time I’m in France, I will be hunting these down. 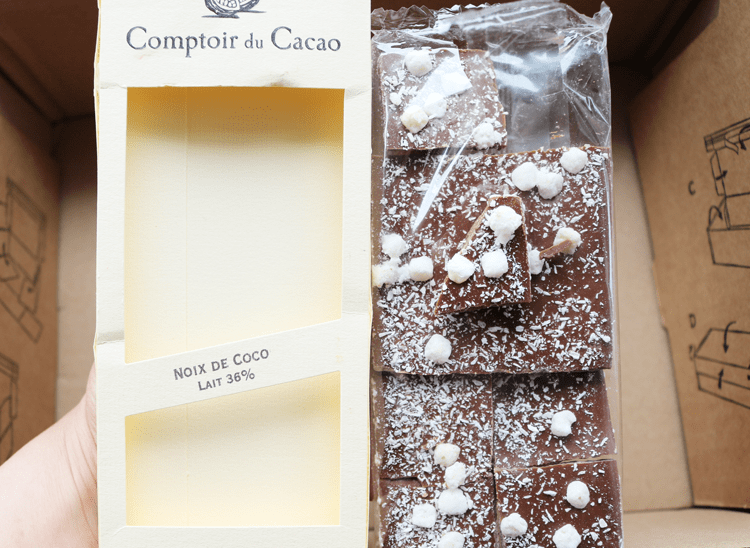 Underneath everything else, I found a large bar of Comptoir du Cacao Chocolat Noix De Coco (worth €5). 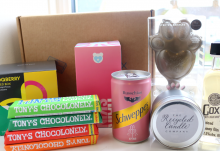 This is from an independent family run artisan business who specialise in traditional and French homemade chocolates. This bar was exceptionally good – 36% milk chocolate with 12% coconut – a winning combination in my book. 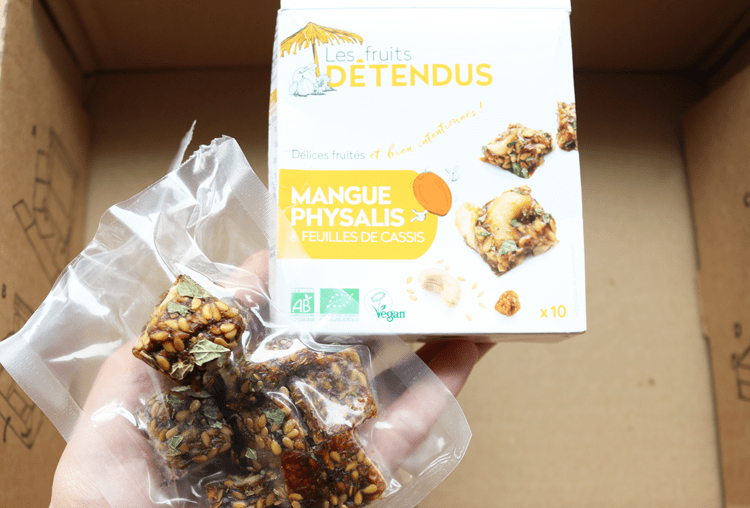 The last product was something much more healthier and was a box of Les Fruits Detendus Delices Fruites in Mango and Physalis (worth €4). This box contains 10 pieces of a pressed mixture of dried fruit, snacks and aromatic herbs, for a healthy snack on the go. They were satisfyingly chewy and full of flavour. 100% natural, organic and suitable for vegans. 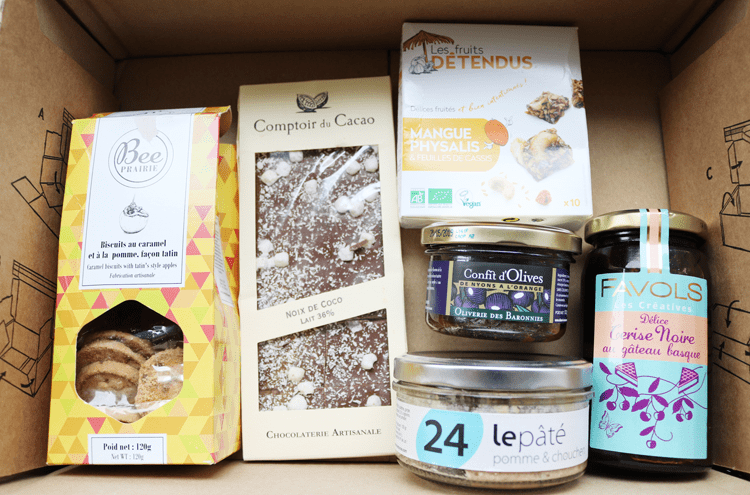 A great box of sweet and savoury French food products, and a good way to discover something new! 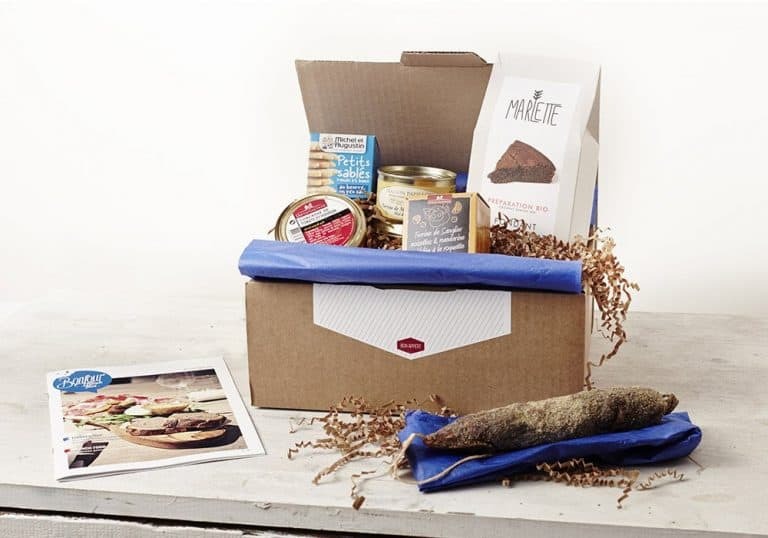 If you love French food or want to discover something new to tickle your tastebuds, this box is a great way to try out lots of different authentic French products.